In the last post, I posed a food-and-wine challenge, to which I will now supply my answer. Which of the three wines displayed on this photo was the best match for the Bobby Flay's pan-fried tilapia fillet, topped with lemon-butter and green olive tapenade, with a side of roasted butternut squash with vinaigrette dressing? 1. Vosne-Romanée "Vieilles Vignes", Alex Gambal 2007 ($60.00). 2. Pouilly-Fuisse "Les Ménéstrières", Domaine J.A. Ferret 2005 ($50.00). 3. Pouilly-Fuisse "Les Vernays", Domaine J.A. Ferret 2005 ($27.00). When I think seafood and butter, naturally I think white Burgundy. Especially 1er cru or grand cru with creamy richness that typically comes from a combination of ripe grapes and oak barrel aging. But also, I look for acidity to cut through and contrast the butter. Here I had two white Burgundies that I knew from tasting the day before were rich. I also knew that the "Les Vernays" was already in its drinking window while the "Les Menetrieres" still needed a couple of years to open up. I wasn't entirely sure which one would match better though, so I tried both. 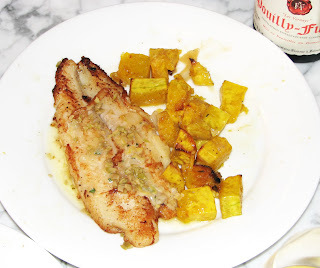 "Les Venays" was more open and fruity, and quite rich, overpowering the fish. "Les Menetrieres" was a bit leaner at this stage and more acidic, which matched the fish better, but still a bit too round and even bland. At this point, it occurred to me that the lemon in the butter and the olives on top of the fish were the key (as they say "pick the wine to match the sauce!") - I needed something leaner and more acidic. Since normally I don't pair red wine with fish, reluctantly I tried the red Burgundy. And.. voila! Alex Gambal's Vosne-Romanee "Vielles Vignes" 2007 is a very perfumy, elegant, very complete wine with light-to-medium body and light texture - and it turned out a major hit with the lemon/olive mixture, not to mention the vinaigrette over the squash. Not only did the body of the red wine match the dish that after all wasn't all that rich, but also the cherry flavor on Pinot Noir really added a delicious dimension to the fish. 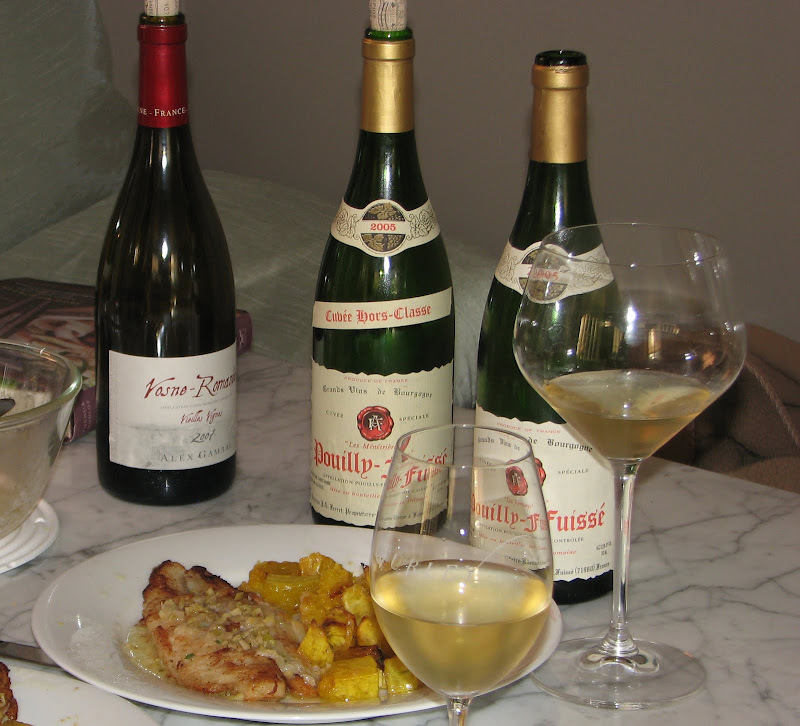 The refreshing acidity and the earlier approachability I have observed in the 2007 vintage red Burgundies were very much appreciated in harnessing the lemon/olive tartness of the sauce and the light texture of the fish. In the past two weeks, I started noticing a pattern: light bodied high-acid fruity wines like red Burgundy or Frappato (Sicilian red) pair exceptionally well with seafood - no doubt common knowledge for experienced sommeliers but quite a revelation for me! I never would have thought of pairing a red wine with a light fish like that, but acidity is one of the keys to wine and food pairing. Looking forward to your next food/wine pairing challenge!